This article will help understand when should we resort to tweaking each CSS style individually and when a simple CSS class addition/removal may do the trick. Out-of-the-flow DOM Manipulation: In case we need to add many elements which are fairly contiguous, then, rather than adding each one individually into their respective place (like insertAfter() in Jquery), we could create everything out of the flow as a DOM Fragment, and then insert it in one go. The concepts are pretty simple, but the availability of simplifying libraries like Jquery sometimes abstracts away the rather pragmatic issues which stop you from creating turbocharged web-pages. Reflow is the name of the web browser process for re-calculating the positions and geometries of elements in the document, for the purpose of re-rendering part or all of the document. 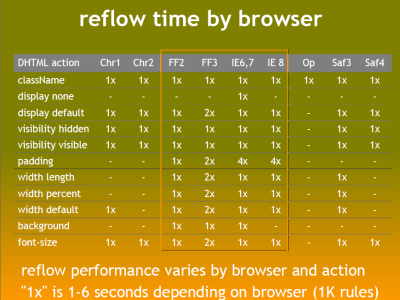 Because reflow is a user-blocking operation in the browser, it is useful for developers to understand how to improve reflow time and also to understand the effects of various document properties (DOM depth, CSS rule efficiency, different types of style changes) on reflow time. Sometimes reflowing a single element in the document may require reflowing its parent elements and also any elements which follow it. At Google, we test the speed of our web pages and applications in a variety of ways - and reflow is a key factor we consider when adding features to our UIs. We strive to deliver lively, interactive and delightful user experiences. Reduce unnecessary DOM depth. Changes at one level in the DOM tree can cause changes at every level of the tree - all the way up to the root, and all the the way down into the children of the modified node. This leads to more time being spent performing reflow. Minimize CSS rules, and remove unused CSS rules. If you make complex rendering changes such as animations, do so out of the flow. Use position-absolute or position-fixed to accomplish this. Avoid unnecessary complex CSS selectors - descendant selectors in particular - which require more CPU power to do selector matching.